NATO has announced it is to deploy a UK military contingent in the Baltic states and set up two more command centers in Central Europe in order to boost security along its eastern flank. Russian observers say that Moscow is certain to take retaliatory measures in response to the alliance’s move. 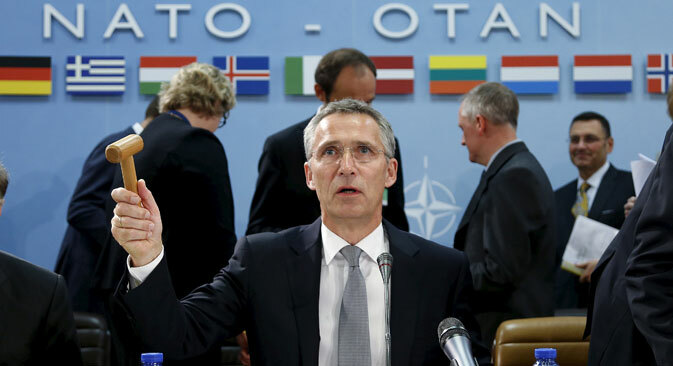 NATO defense ministers have announced plans to beef up the alliance’s presence in Central and Eastern Europe to counter the threat from Russia, while once again accusing the Kremlin of targeting moderate rebel groups instead of ISIS militants with its bombing campaign in Syria. Opening the alliance’s latest summit in Brussels on Oct. 8, NATO Secretary General Jens Stoltenberg welcomed the UK's decision to deploy servicemen to the Baltic countries and Poland on a rotational basis. Stoltenberg also announced the alliance's decision to establish additional command centers in Slovakia and Hungary (six such centers already exist in Central and Eastern European countries), as well as to increase the strength of its rapid-reaction force to 40,000 servicemen. The secretary general said the need to "fortify the alliance" was based on the Ukrainian crisis and Russia's operations in Syria. He also underlined that the alliance's actions "will lead to retaliatory measures in order to create the necessary parity." Head of the State Duma Foreign Affairs Committee Alexei Pushkov reacted more emotionally, calling NATO's decision to further protect the Baltic states from Russia "a theater of the absurd." According to UK Defense Secretary Michael Fallon, the number of troops deployed to the Baltic countries and Poland would be just 100 servicemen. Despite the sparsity of this contingent, Russian observes believe that such steps nonetheless constitute a challenge to Russia. "As a total war scenario (NATO's actions) do not represent a danger to Russia, but as a limited war scenario they certainly do," said Alexei Fenenko of the Institute of International Security Problems at the Russian Academy of Sciences. Meanwhile, Ivan Konovalov, director of the independent Center of Strategic Affairs, said that the NATO commander and communications centers could represent a threat to Russia. According to various mass media, 40 people will work in the centers (formally known as NATO Force Integration Units) and will be responsible for preparing training and solving logistics issues. "Such structures are needed to quickly prepare a group for a particular purpose,” said Konovalov. “Now, if there are eight of them, they will be in all the Eastern European countries that border the former USSR. Basically, such centers will help create formations rather easily." Deputy Director of the Defense Committee of Russia's Parliament's Upper Chamber Franz Klintsevich said that although Russia will certainly react to the appearance of new NATO command centers, it is unlikely to take excessive measures. "Moscow's reaction will be very tacit and concrete, it will be kept within the framework of the existing military doctrine," said the senator, without specifying, however, what exact measures Russia will take. Meanwhile, in the view of experts interviewed by RBTH, Russia's most likely response will be to increase its military formations in the country's western regions. The NATO defense ministers also discussed Russia's military campaign in Syria at the meeting in Brussels. Stoltenberg once again criticized Russia on behalf of the West, saying that Moscow is mostly striking not sites held by Islamic State (ISIS) radical militants but "other opposition groups." Particularly harsh statements about Russia's campaign in Syria came from Pentagon Chief Ashton Carter, who predicted that Moscow's actions "will have consequences for Russia itself, which reasonably fears being attacked." Carter then went on to predict that Russia “will begin to suffer losses in Syria” in the upcoming days, drawing a sharp response from Russian Defense Ministry spokesman Igor Konashenkov. "In their evaluations of America's various military campaigns conducted throughout the world, never have Russian Defense Ministry representatives stooped so low as to publicly express their expectations of the deaths of American soldiers. Not to mention ordinary Americans."